Biochemist Arthur Kornberg was the first scientist to identify deoxyribonucleic acid (DNA) polymerase in the intestinal bacterium E coli. Establishing that this enzyme catalyzes the production of new DNA strands, Kornberg showed how a single strand of DNA forms new strands of nucleotides, and proved the double helix structure of DNA, as theorized by Francis Crick, James Watson, and Maurice Wilkins. In 1959, Kornberg was awarded the Nobel Prize in Medicine, sharing the honor with Severo Ochoa. 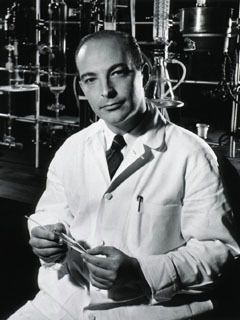 While attending medical school, Arthur Kornberg contracted hepatitis, a disease of the liver that often triggers jaundice, where caucasian skin yellows. Based on his own experience and study of the disease, he wrote his first scientific paper, "The Occurrence of Jaundice in an Otherwise Normal Medical Student." He later investigated nutrition, enzymes and metabolism at the National Institutes of Health, and worked with fellow Nobel laureates Carl and Gerty Cori and Paul Berg. In 1966, Kornberg discovered an enzyme called ligase, which closes the ring of DNA, and subsequently crafted the first artificial viral DNA. His first wife, Sylvy Ruth Levy Kornberg, was also a biochemist, and a frequent collaborator on her husband's research. Their son, biologist Roger D. Kornberg, was awarded the Nobel Prize in Chemistry in 2006, for furthering research into DNA. Another son, Thomas, is a biochemist, and made important DNA discoveries in the early 1970s. Their third son, Kenneth, is an architect who specializes in designing biomedical buildings.